Hal Leonard Publishing Corporation, 9781597733274, 43pp. (Homespun Tapes). 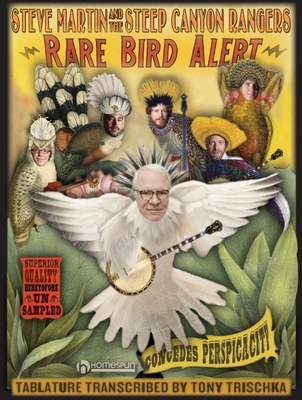 Steve Martin's latest CD, Rare Bird Alert, has received raves from critics, fans and players alike. His 13 songs and sparkling banjo solos, in both clawhammer and three-finger picking styles, are whimsical and fun-filled, always beautifully crafted and superbly played. This new book features tablature and lyrics, and Steve has added brief instructions for playing each tune. Songs: Rare Bird Alert * Yellow-Backed Fly * Best Love * Northern Island * Go Away, Stop, Turn Around, Come Back * Jubilation Day * More Bad Weather on the Way * You * The Great Remember (For Nancy) * Women Like to Slow Dance * Hide Behind a Rock * Atheists Don't Have No Songs * King Tut.